World Rugby, FIFA and the International Hockey Federation (FIH) have developed a ground-breaking protocol for multi-surface playing fields that could revolutionise how shared sports grounds are used and enjoyed around the world. After many years working together on this project, including detailed discussions with industry leaders, the three federations have managed to balance player welfare and performance with playability for an initiative named ‘One Turf Concept’. While it is specific to multi-sport venues, the concept can also be applied to any artificial turf sports field not designed to comply with a specific sport-based requirement. The federations will continue to work with manufacturers and test laboratories in refining standards so as to increase the performance and longevity of the playing fields, which are so important to rugby, soccer and hockey, especially at the community level where available space and finances may be limited. World Rugby Chairman Bill Beaumont said: “This is a fantastic example of cross-sport co-operation that will benefit grass-roots sport all over the world. While the elite level of each code has a distinct need that often requires its own specific playing surface, 99 per cent of players fall outside that professional, elite group and have different requirements. The industry, in the form of the European Synthetic Turf Organisation (ESTO) and the Synthetic Turf Council (STC), supports the initiative as a basis for the design and development of a sports facility. The ‘One Turf Concept’ is separated into three parts, and should be consulted depending on the age of the field considered. For existing fields, it gives an overview of the minimum performance requirements that should be achieved by the field to ensure it addresses the player interaction requirements for a multi-sport surface. It also gives guidance on the ball interaction requirements that should be achieved. Player performance and ball interaction requirements as detailed above. Guidance on ensuring the longevity of the field through undertaking laboratory testing which simulates the wear and degradation of the individual elements due to climatic conditions. Identification tests to ensure that the surface tested in the laboratory matches that installed on the field. Guidance for those fields looking to achieve certification from one or more international federation with the identification of additional requirements that are insisted upon by each individual federation. World Rugby, FIFA and FIH recognise the importance of the implementation of a regular and comprehensive maintenance regime to ensure that any artificial turf field continues to perform as intended throughout its lifetime. Adherence to the ‘One Turf Concept’ or to the individual performance requirements set out by the individual federations is unlikely to be achieved over the full potential life of the product without proper maintenance. The ability of a surface to achieve these standards should be measured through initial testing, performed when the surface has been installed, and regular testing throughout its lifetime. Full details of the ‘One Turf Concept’ including extensive research data specific to artificial turf for rugby can be found HERE. European Chemicals Agency (ECHA) issued a report that "found no reason to advise people against playing sports on synthetic turf containing recycled rubber granules as infill material." In June 2016, the European Commission asked the ECHA to evaluate any risk to the general population, including children, professional players and workers installing or maintaining the fields from synthetic turf fields with recycled rubber infill. The ECHA's advice is based on their evaluation that there is "a very low level of concern from exposure to substances found in the granules." The ECHA found that the concern for players and workers for lifetime cancer is very low, for metals is negligible and for phthalates, benzothiazole and methyl isobutyl ketone there are no concerns. The ECHA also noted that their conclusions are consistent with those found in the recent Dutch RIVM and Washington State studies. In an effort to distill all the changes to the new manuals issued by world governing bodies in the past few months Sports Labs have put together this helpful guide. Simply click on the link. FIFA will issue the new Handbook of Requirements and the Handbook of test methods for the FIFA quality concept for football turf. This much talked about update has involved some radical changes to the preparation and evaluation of football turf for FIFA certification. The new manuals will be available for download next week we will post a link. The new FIFA quality pro and FIFA quality perhaps making a clearer distinction between community and pro fields this is a welcomed change. A new Lisport XL is making it debut and new tests for infill splash, heat on surfaces and yarns for UV and thickness to name just some of the changes in this a fairly significant overhaul of the 2012 version. Sports Labs will be providing a detailed communique on the changes early next week or better still come see us on our stand at FSB next week. The first hammers will be flying onto the demonstration area at Crownpoint Track next week! This experimental surface has been designed to test the ability of artificial turf to deal with hammers and javelins impacting the surface. Watch this space for results. UJSportslabs recently travelled to Lesotho to conduct FIFA 1 Star performance testing on a newly installed football turf. The main reason FIFA insist on these tests is to ensure the safety of players and quality of the installation of the football turf. The football turf is the first of its kind in Lesotho and is one of many Goal projects currently being funded by FIFA throughout Africa. The artificial turf manufactured is Edel Grass a FIFA Preferred Producer using it's Superblade 50 SB-S carpet filled with silica sand and SBR. The installation was carried out by Mesut Okutucu from Edel Grass. Key to the lifespan of any football turf is regular maintenance. Maintenance equipment was provided and members of the community were trained to conduct the various maintenance requirements as part of the project. The community is very excited and happy with the new football turf! 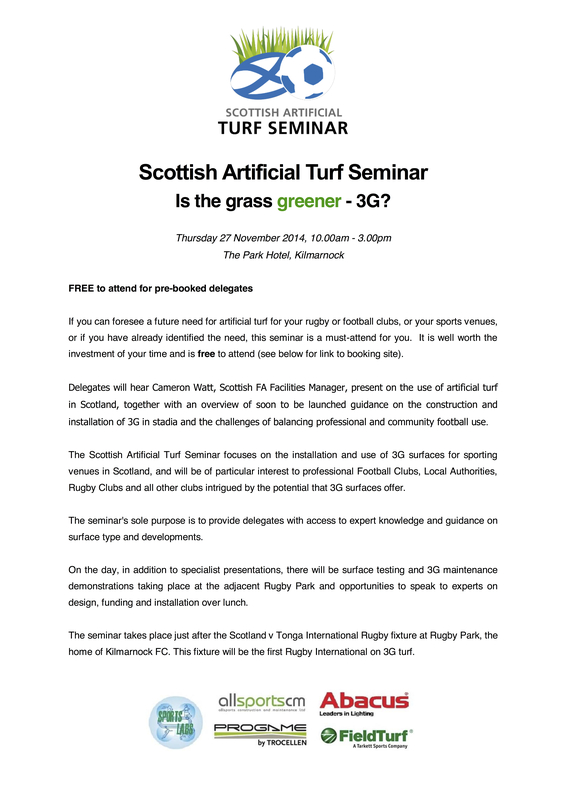 In Scotland it's 'game on' on league artificial turf pitches! STE the only dedicated sports surfaces testing equipment supplier, launch their new web site today. An easy to use platform which allows you to purchase what you need online. Alternatively if you require further information you can make an enquiry for the specialist equipment that you have questions about. Whether you want to buy an infill depth gauge or a AAA device STE can help you with your needs. Quick delivery times and a dedicated set up with the more complex items. Simply go to www.sportstestequip.com for the most competitive quality equipment on the market. Sports Labs working for Glasgow Life the Leisure Trust operating the sports facilities for Glasgow City Council upgrade 2 No. 3G pitches Working closely with Glasgow Life and Glasgow City Building Sports Labs provided consultancy services to design, procure and manage the refurbishment of two pitches in Glasgow. The good news is that both pitches were designed to allow football and rugby use, the bad news is that both were hockey pitches and now these facilities are lost to hockey. Hockey in Glasgow has moved to the new Commonwealth games venue so it is not a complete negative for that sport. These refurbishments have reinvigorated what were very dilapidated facilities these are now thriving community based hubs. The biggest beneficiaries of course are rugby who now have excellent training facilities where before there were none! See attached synopsis of the work done to upgrade the facilities.